1. Picked up the hand towel from the bathroom floor. 2. Discovered someone else's bodily fluid somewhere on your clothes. 3. Carefully arranged trash over something you didn't want the kids to know you threw away. 4. Told the kids "one cookie is enough" and then ate 6 after they left the room. 5. Burned food while multitasking. 6. Replaced a toilet paper roll... using the new roll someone left sitting on top of the empty holder. 7. Had a mental breakdown triggered by the sight of a random sock lying on the floor. 9. Washed the same load of laundry twice because you forgot to move it to the dryer. 10. Secretly cackled inside your head when you vacuumed up a Lego. 11. Put something in a special place so you wouldn't lose it and then forgot where that place was. 12. Did something your pre-kid self would have found disgusting. 13. Picked up dirty clothes from the floor right next to the hamper. 14. Ignored the voice in your head saying "This is such a cliché" as you ate a candy bar while hiding in the bathroom. 16. Thrown away a carton containing 4 drops of juice from the fridge. 17. Googled "how to clean _________ out of _________." 18. Arbitrated disputes by yelling through the bathroom door. 19. Tried a new parenting technique from the Internet and had no clue what to do when the kids didn't respond like they are supposed to. 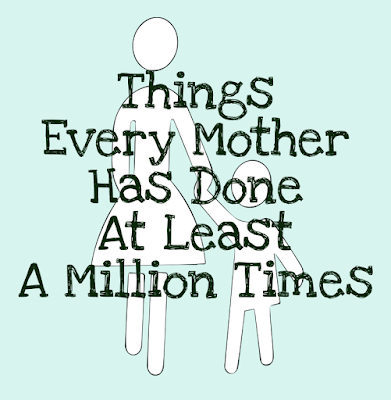 All of these are things you'll do many times as a mother, sometimes even in the same day. Oh, and you should probably spread trash over that candy bar wrapper in the bathroom garbage. The kids will see. Yes! So many of these I've done frequently, and my little guy is only 7 months old! I really, really need to learn to quit multitasking while making food, but the urge to multitask is strong, and I usually forget that it always winds up in extra messes or burned food. I did 1, 2, 5 and 6 simultaneously earlier today... in other words, YES! I love this! I'm not a mom yet, but I'm totally guilty of re-washing a load of clothes because I leave them in there too long. Also, my husband is forever leaving things in the fridge with four drops left. He always says "I thought you might want to finish it." No, it's half a teaspoon. I don't want it! 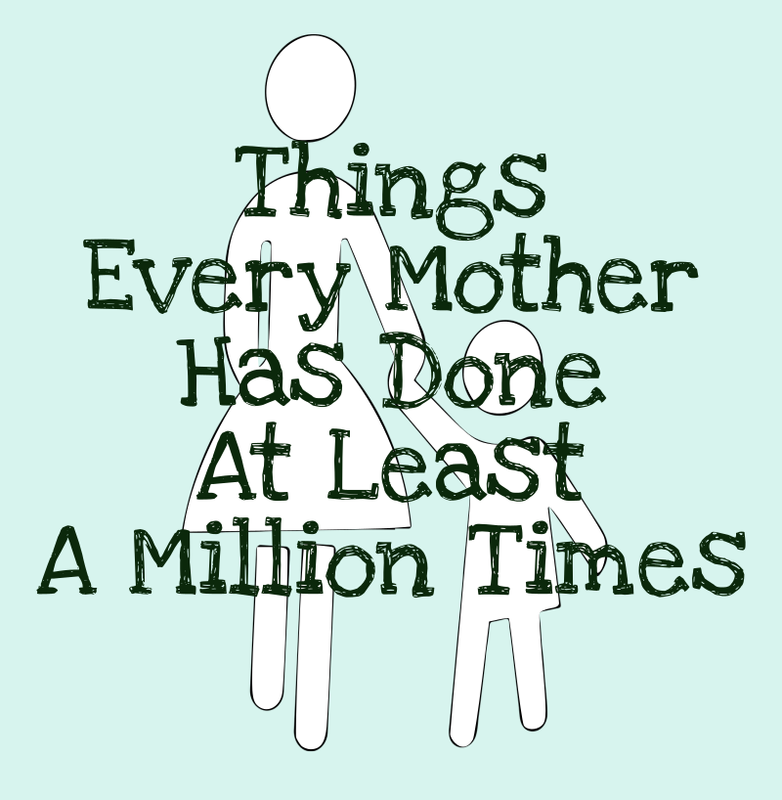 Originally I was going to call this post "Things Every Mom Has Done A Million Times" and then decided I'd probably done each of these way more than just a million. So I added the "at least" as a disclaimer. Yep! Pretty sure I have done them all! Good news: according to this, I am a "normal" mother. Which is refreshing, because "normal" is not a word people often use to describe me. Thanks for the boost this morning! ;) Stopping by from Friday Frivolity! Haha very funny! I am also guilty of re-washing clothes and turning dishwasher back on .. to buy more time before I have to deal with said clothes and dishes. I know. That's bad, isn't it? I'm lol'ing because I've done all of the above! Favorite post of the day! You should link this up at #bloggerspotlight too!! Haha I think I did at least half of them today! My biggest pet peeve right now is how they go to throw something away and it falls right beside trash can and they don't pick it up and throw it away again. Stick around, and I will make you feel like the most normal mother that has ever mothered! Yesterday my 5-year-old unwrapped something and literally just threw the wrapper on the ground at her feet and started to walk away! This was in the living room, by the way. I was like "What are you, a medieval king? A caveman? Get back here and throw that in the garbage can!" I know they're expensive, but it just feels GOOD anyway. Hahaha! I've already done #9 today, and #15 and #19 are so unfortunately true. Thanks for joining us at the #happynowlinkup!